A new way of synthesising? Were we naïve to expect the world to stop turning? Perhaps, but RayBlaster is still a great synth. Unusual synthesis engine. Sounds fat, fresh and full of personality. Interesting (no) filter concept. Sample resynthesis. A pleasure to program. Only a few presets do it justice. Manual too dumbed-down. A tad pricey. RayBlaster is the latest synth from Tone2, shipping with around 500 presets and employing a new technology called IMS (Impulse Modelling Synthesis) to - according to its inventors - generate sounds unlike anything we've ever heard before. Detailed information on how IMS works is scarce, but we do know that the oscillators do their thing using little grains of sound called 'windows'. These windows interact with the main oscillator waveforms to produce rich and complex textures, like an advanced form of amplitude modulation. "The instrument is intentionally designed to be different from the synthesiser norm"
There are two oscillators on board, each capable of loading a pair of waveforms, including various forms of sample import. Unusually, there's no conventional filter section with the familiar cutoff and resonance controls. This is because the oscillators themselves imitate the functions of a filter via the Formant knob instead. For your money, you get a standalone application (something we always appreciate) plus AU and VST plugins. The instrument is intentionally designed to be different from the synthesiser norm, and as such, you can pretty much disregard your typical analogue-style programming techniques. This is a synth geared towards helping you to create patches you never would have happened across. Because of its different interface and processing methods, RayBlaster requires a very different workflow, helping it to sound genuinely different. "The presets cover a wide range of sounds, from chainsaws to pianos and dreamy pads"
The presets cover a wide range of sounds (from chainsaws to pianos and dreamy pads), but to get the most out of RayBlaster, you're best off initialising it and hurling yourself at it with playful curiosity. The bad news is that Tone2's documentation puts style before substance; the good news is that it's a fun and intuitive synth to program anyway. After thoroughly exploring the factory bank, we were soon able to cook up spooky drones, sharp leads and grimy basses with relative ease. The oscillator section might take a moment or two to take in on first use, but the modulation matrix, LFOs and envelopes don't prove challenging, offering a common enough framework to encourage usable results without a big learning curve. There's a familiar Tone2 feel to RayBlaster, partly because of the interface design (which is consistent with the company's other products) and partly due to its subtle sonic nuances. 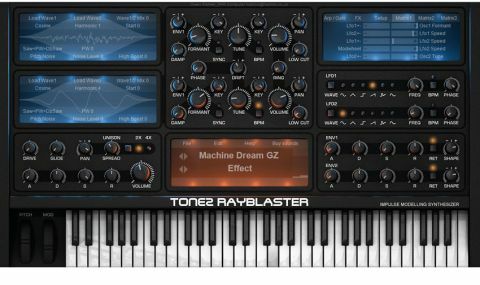 That's not to say that RayBlaster sounds too much like Tone2's other products, but rather that they have something of a signature sound that will be immediately obvious to anyone well acquainted with their other plugins. We really enjoyed getting into RayBlaster, and it certainly does offer a new way of working that stands apart from the more traditional synth plugins out there. However, it's not really the game-changer that Tone2 have made it out to be. Although the methods by which the sounds are achieved are somewhat novel, what we were able to produce with it - and the included presets - didn't do a great deal to radically differentiate it from other forms of digital synthesis out there. In its most characterful moments, RayBlaster sounds similar to pre-existing wavetable, wavescanning, waveshaping and granular synthesisers, but a lot of the time it just doesn't sound as silky or pristine as the competition. "More than just fun, this is a highly expressive synth that lends itself very well to modern musical styles"
Although capable of many different flavours, there's an overall metallic edge to the sound whenever the oscillator waveform gets complex (often when, but not limited to, importing samples for resynthesis). Some may like this, but we found it slightly off-putting, preferring to stick to bold and simple patches, which it's pretty good at. The Damp knob goes some way towards softening harsh frequencies, but it's by no means a comprehensive solution to the aforementioned metallic artefacts. For us, the best thing about RayBlaster is that it requires an almost completely new thought process to get to the end result, yet it manages to still be very immediate and easy to use. More than just fun, this is a highly expressive synth that lends itself very well to modern musical styles, and it certainly has enough options and possibilities to remain interesting and fruitful long after the initial purchase. Where it really shines sonically is in producing screaming leads, futuristic FX shots and dirty bass - particularly when done in an intentionally bold and 'digital' fashion. You will find it ideal for techy dance patches, but it's not really anything we've not heard before. RayBlaster and its Impulse Modelling Synthesis technology aren't the aural revolution we hoped for, then, though it is inarguably a very powerful synth.